This continues my recent theme of using the Tea Room Memories & More cards to start off a cardmaking stash. Here I've used two cards from the pack with similar print but different sizes. The base card is Thick Very Vanilla and I've made mats with Coastal Cabana cardstock. I've included the dimensions below. We've already covered all the steps required to make this card but now we're adding a new technique - heat embossing. 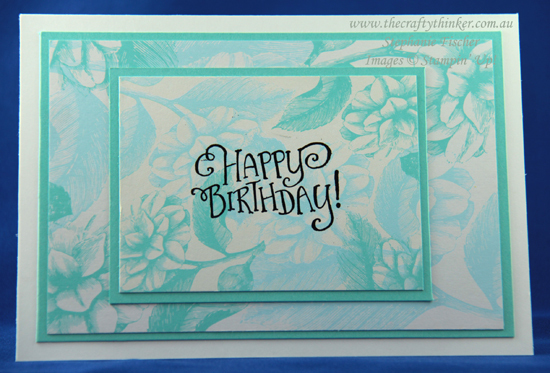 In order to add the heat embossed greeting in the centre of the card you'll need to add some more products to your craft room stash but don't worry - they'll last you a very very long time! I've used black in this sample and that's the colour I would recommend as a starting place. As and when your budget allows, other must have embossing powders (in my opinion) would be clear, silver, gold, white and copper. A little goes a long way so, although the pots looks small, they will last a long time! This is a clear pigment ink. It stays tacky for a while, making it perfect for holding the embossing powder in place. This is the biggest investment but it's great quality and will last the distance! The Stampin' Up heat tool has two heat settings making it useful for things like drying ink as well. Mine gets quite a work out! Technically you can heat emboss without this BUT it's a very small investment for perfection and I'm pretty sure it will last a lifetime. Use this to wipe over the cardstock before you start the heat embossing process and it will remove any residues to which the embossing powder may adhere, causing unwanted marks or splodges! The fine embossing powder can even stick to our finger prints. The embossing buddy eliminates all those problems and ensures that the embossing powder only sticks where we want it to stick. You'll also need a stamp. The greeting I've used is from the Better Together stamp set which has bold greetings that cover most situations. This is going to be an investment in your future crafting. Choose a set that appeals to you, something that seems like it will be versatile (can be used for a variety of occasions, has a mix of good sentiments and images, can be paired with other things). You'll also need to give some thought to the type of stamp set. Wood Mount sets cost a little more and take up more storage space but they come with their own wooden block. Clear Mount and Photopolymer stamps require appropriately sized acrylic blocks in order to use them but they take up less storage space and are less expensive. The acrylic blocks last forever and can be purchases as a complete set or individually as you need them. When pouring the powder onto your project, work on a sheet of paper with a valley fold in the middle. The paper will catch the excess powder and the valley fold will make it easy for you to pour the powder back into the container. Experience will teach you at what height and for how long to heat the project for perfect heat embossing. Heat in one place at a time until the powder melts and goes shiny and smooth then move to another part of the project. Overheating will burn away the embossing, so if you find that your heat embossing is looking matt rather than shiny, try heating it from a great distance or for less time. See this video for more basic tips. Once you're ready, you might find this video useful for some different ways to use heat embossing. Very Vanilla: 9.5" x 6.75" scored and folded (on long side) at 4.75"